Sometimes the best moments in life are the ones you don’t plan for. Matilda is our third child. Our first baby was born via emergency caesarean at 41wks and 4 days, after a cascade of intervention and a labour on the bed. Our second baby was a well researched into vaginal birth in the hospital, at 35weeks. 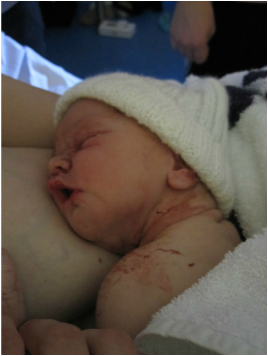 So for our third baby we were feeling empowered & well researched, and had chosen to have our first homebirth. At just over 40wks labour started with some mild contractions… or so I thought. I went for a walk & dropped the kids off at their grandparents, and then went for more walks with each of my special doulas. My children arrived home for bed at 7pm, very excited to find out Mum was ‘in labour’, and things really started to kick off from there. Fast forward to 4am, two midwives, a full birth pool, and much laboring later… turned out it was a fake labour! Feeling so blessed to have no pressure for progress from the medical system, I was peacefully tucked into bed by my birth team for some good rest. (Important to note at this point that baby was happy, and every midwife who felt my abdomen was sure she was head down). I continued to have a contraction every couple of hours for five days. On the Sunday we went to church where I found things became a bit more intense, so went home afterwards and straight to bed for a rest, in case this was the day. Next minute, I intuitively knew my waters were breaking and leapt out of bed just in time. I decided to go back to bed, after letting all my birth team know what was happening and a fresh change of clothes, to get some more rest for the work ahead. After 30mins I went to the toilet and discovered my waters now had meconium in them. I called the midwife who said she was on her way. I continued to labour, mobile and upright while my birth team arrived, peaceful knowing meconium does not necessarily indicate an all out emergency. On arrival my midwife and her wonderful 3rd year student discussed with me the meconium may be caused by a baby in a frank breech position. A PV exam confirmed it. So just as my husband had filled the pool for the 2nd time, I announced we were having a breech baby and were off to hospital! I was already 4cm dilated when we left and the 7min car ride was intense, but a fabulous time to regroup, pray and laugh together as a birth team. Once in the hospital, my options were outlined by the obstetric team. However, I had two very highly skilled midwives in breech birth, two fabulous doulas, and a very supportive husband, and I trusted my body’s ability. While I was ‘considering’ the caesarean things were happening very quickly. I was laboring against the side of the bed on my knees, on a mattress on the floor, using hot towels to manage the pain. I went from 6cm dilated on admission to 10cm 20min later. I moved to the bed on my knees, holding onto the bed rail, and Matilda’s bottom came into view shortly afterward. She unfolded like a beautiful butterfly, legs unfolding, followed by her arms. Not much happened for quite some time after that. It was the most amazing thing to look down and see her whole body, but no head, just hanging there! My birth team (including the assisting OB) tried the lithotomy position to help her head budge, but to no avail. An episiotomy was done, and Matilda was born, weighing 6lb 2oz. Her Apgar scores were 2, 5 and 8. She was resuscitated for 6mins. The amazing thing was that my husband and I were completely calm through this process, having been well informed by our midwives during labour that breech babies often need assistance when they are born, and just to speak to her when she is born etc. And so my husband held her hand and I called out encouragement to her and sent her my love, until she was placed on my chest 20mins later. Matilda was a very quiet baby for a couple of days, spending much of her time on her parents. She was given expressed breastmilk as showed no interest in feeding. By day 3 she came alive, and has been a determined, gorgeous and extremely bright young lady ever since. She went on to breastfeed fantastically, putting on record amounts of weight every week. She had the breech ‘froggy legs’, so we called her baby starfish. She had no hip problems, but is still very flexible! We are forever grateful to our supportive team.